Local service provider for all your drainage, plumbing, heating, and ground works requirements. No matter what the size your project is – small or big we can help you get all the work done efficiently in less time. We are proud to serve almost all the towns of West and East Sussex County including Worthing, Chichester, Littlehampton, Brighton, Shoreham, Hove, Horsham, East Grinstead, Haywards Heath and Crawley with professional and budget-friendly services. At 1st Clear Flow, the standard of the services that we provide is highly sophisticated and efficient. 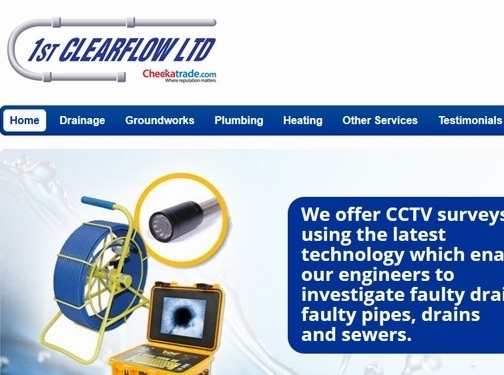 The 1st Clear Flow engineers are well trained, experienced and locally knowledgeable. Together we strive to offer the best drainage, plumbing and heating services around the West and East Sussex County. Just give us a call on 01903 212392 and our experts would be available at your doorstep in the next available time. We take up jobs from all departments like – domestic, commercial, industrial and so on. In case of emergency services which need tasks like drain unblocking, drain clearance, blocked drains, sewage treatments, high-pressure jet washing, plumbing issues and heating we can get things sorted for you. Professional service with a very friendly approach. If you have a problem with your drainage systems or are trying to replace it, then we are the best choice for this task. The techniques that we use are highly precised which help us to provide you services like – drain lining, drain unblocking, drain clearance, root cutting, and drain road retrieval and many more. This includes above and below ground drainage repairs and renewal, damaged water mains repairs, manhole rebuilds and so on. New or old bathroom, we can take care of all plumbing needs required for your office, house, industries, etc. This includes services like – new bathroom installation, taps change/repair, etc. Any services required with regards to heating like – replacement/repair/servicing of the boiler, fitting new radiators, thermostatic radiator valves, pumps and zone valves, etc, we can help you with it. So, no more hassles in your family home or commercial premises due to drain blockages, bathroom pipelines and so on. We are just a call away to make your life easy and hassle-free. Read more about our Drainage and Plumbing Services in the following areas. If you have any questions or would like a quotation, please give us a call. UK (Worthing, West Sussex) based business providing plumbing and heating services. Website includes details of services provided, testimonials, news section, full contact details.